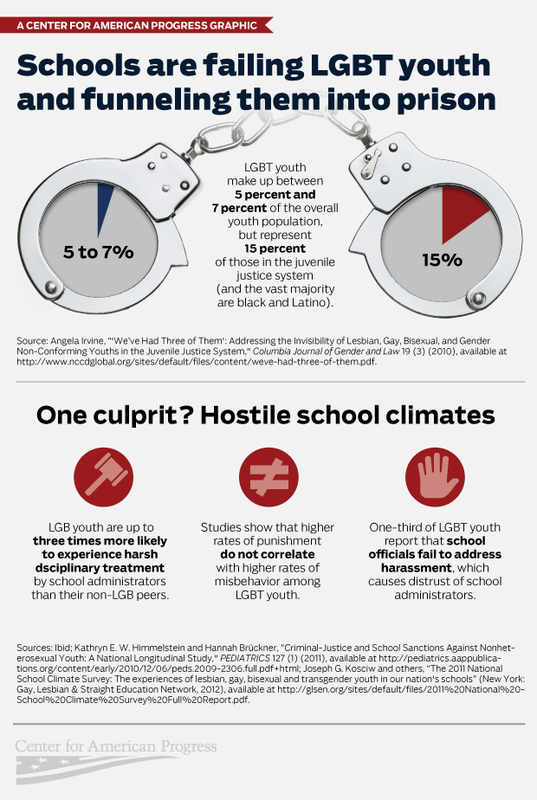 Hostile school climates pave the way for lesbian, gay, bisexual, and transgender, or LGBT, youth to spend less time in school and more time on the streets, thus increasing the likelihood of entering into the school-to-prison pipeline. By promoting safe, welcoming, and affirming school climates, policymakers and school administrators can ensure that LGBT youth—who all too often face harassment and discrimination in school—will excel. Make no mistake, hostile school environments encompass much more than peer-on-peer bullying: dress codes, unenumerated policies, lack of access to LGBT resources, and zero tolerance policies, for example, all feed the school-to-prison pipeline. The numbers are clear: The actions and inactions of adults in schools derail LGBT youth and unless these climates become more welcoming, schools will continue to fail LGBT youth by pushing them into a cycle of unfair criminalization. Preston Mitchum was a Policy Analyst with the FIRE Initiative at the Center for American Progress, which examines the impact of public policy on LGBT people of color.